Mahindra's champion rally driver, Gaurav Gill gets behind the wheel of XUV300. Compact SUV segment is currently dominated by the likes of Maruti Brezza, Tata Nexon, and Ford EcoSport. It is the fastest growing segment, registering a CAGR of 44% in the last 5 years. Current volumes are 35-40k per month, contributing around 60% to the total UV segment. Mahindra is keen to capture 15-20% market share in the compact SUV segment with XUV300. To do so, Mahindra plans to launch XUV300 with best in class features, space and power. One thing that is unique to Mahindra XUV300 is that it has the longest wheelbase among all compact SUVs globally. This translates into easy ingress and egress and provides more space and legroom and comfortable seating on the inside. And above all, it helps to deliver best in class driving dynamics. Ahead of its launch on 14th February, Mahindra XUV300’s first official TVC has now been released. The video shows India’s champion rally driver, Gaurav Gill driving the compact SUV. 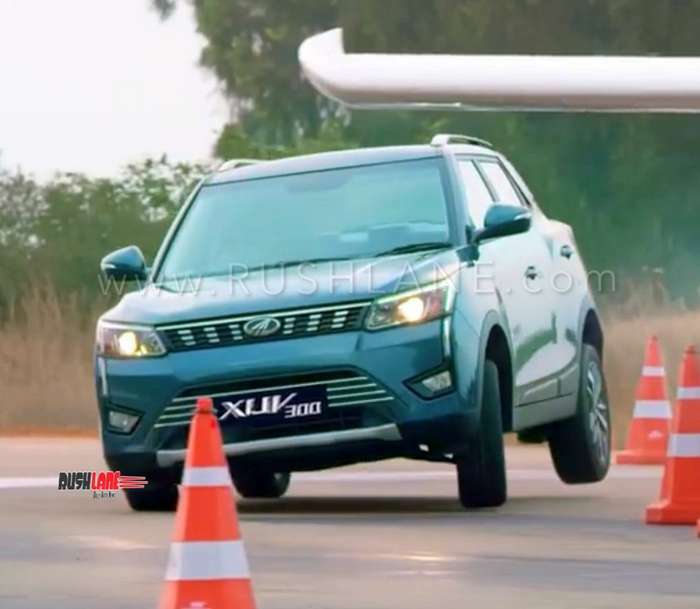 In the 2 minute vide, you can see Mahindra XUV300 undergoing different set of tests. It accelerates, turns, skids, drifts, and even flies (although momentarily). If the market was not buzzed enough with the XUV300, it sure is to get electrified by this new TVC video. Watch the video below. XUV300 will come with advanced safety features such as ABS with EBD, ESP, reverse camera and parking sensors, seat belt reminder, speed alerts, and ISOFIX child mounts. These features are compliant with Bharat New Vehicle Safety Assessment Program (BNVSAP) norms and will be offered as standard across all variants. With such a comprehensive list of offerings including several segment-first and best-in-class features, XUV300 has the mojo to take on rivals in the compact SUV space. Official bookings have opened. And while the vehicle promises a number of segment firsts, there’s always the standard difference between trims as base variants offer that much lesser. Mahindra XUV300 base variant features a 2-din audio system, LED tail lamp cluster, MID on the instrument console, and power windows (with one touch anti pinch for the driver side). XUV300 has dual-tone premium interiors featuring an appealing colour combination, luxurious leather upholstery, large touchscreen infotainment system, wing-shaped instrument panel, electronic sunroof and a sophisticated dashboard that looks super cool with bold and luxurious combinations of high-gloss black and luminescent silver. Once launched, it will take on Maruti Brezza, Tata Nexon and soon to be launched Hyundai Carlino Styx.